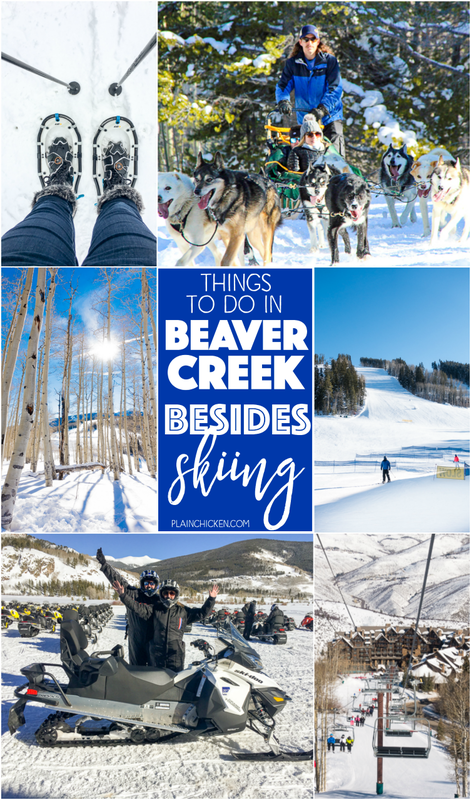 Things to do in Beaver Creek, CO (Besides Skiing) - skiing is the main attraction in Beaver Creek, but there is SO much more to do!!! 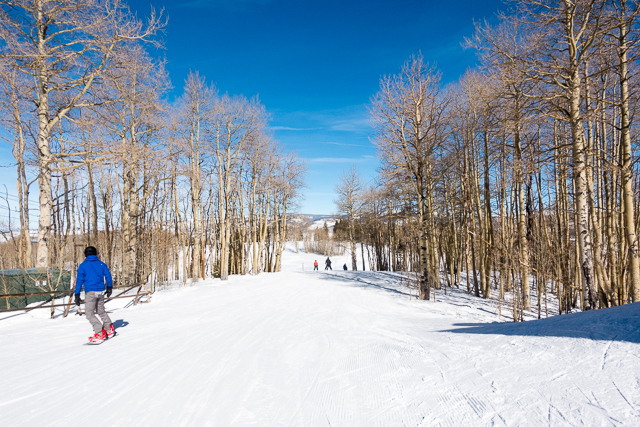 Even if you are an avid skier, you aren't going to want to miss out on these fun activities! 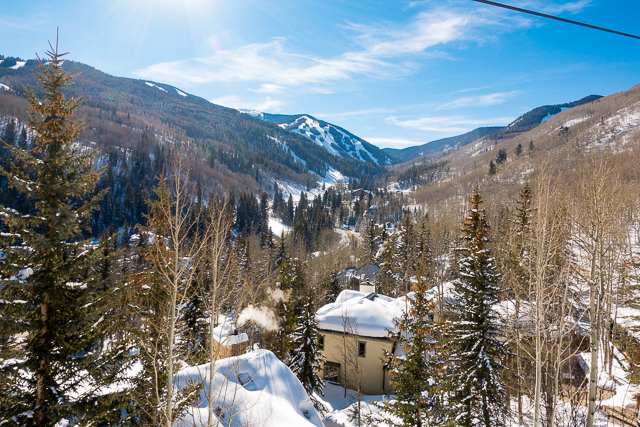 Skiing is the main attraction in Beaver Creek, but there is SO much more to do!!! 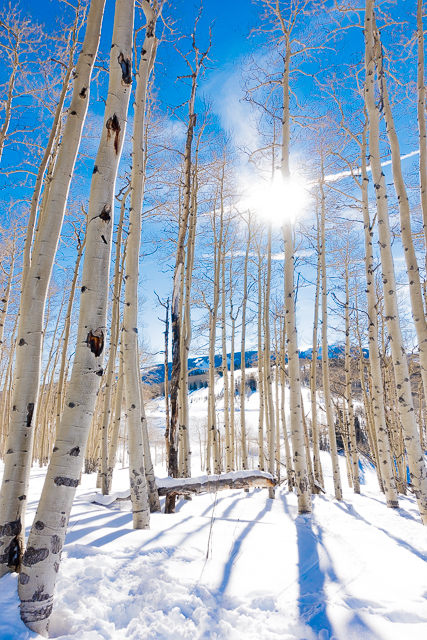 Snowshoeing, snowmobiling, dog sledding and taking a scenic lift/gondola ride! 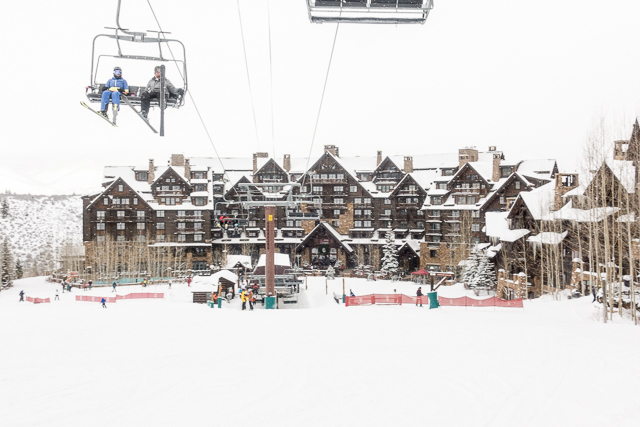 As a non-skier, I LOVED it! Chicken Legs did ski one day, but every other day we did a non-skiing activity. 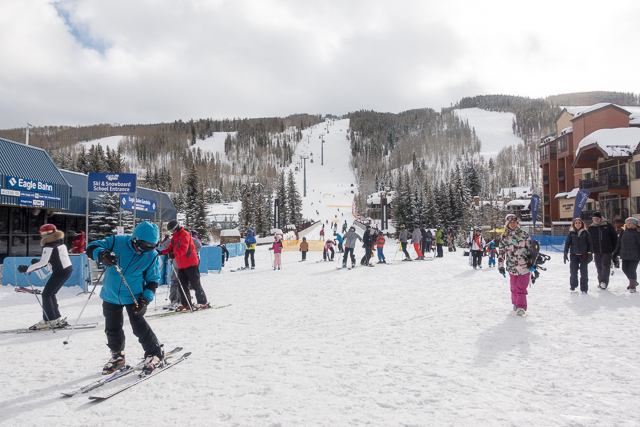 Even if you are an avid skier, you aren't going to want to miss out on these fun activities! 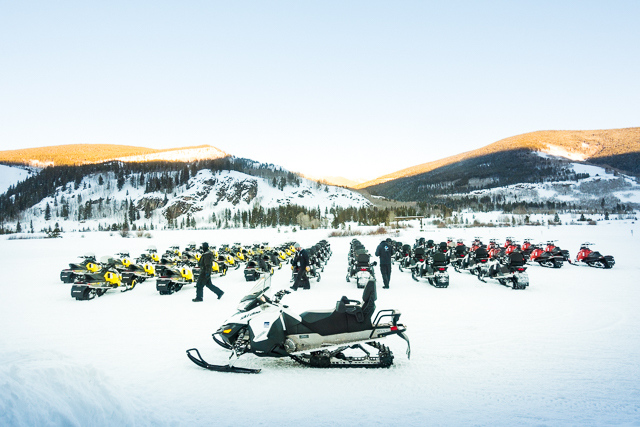 Our first big activity in Beaver Creek was Snowmobiling with Nova Guides. 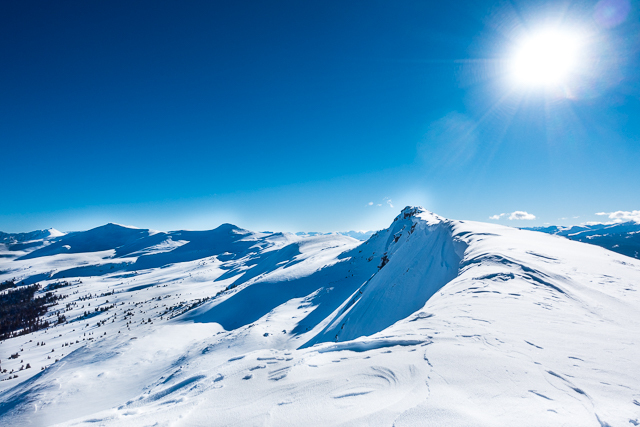 We chose the Top of the Rockies half-day guided tour at Camp Hale. 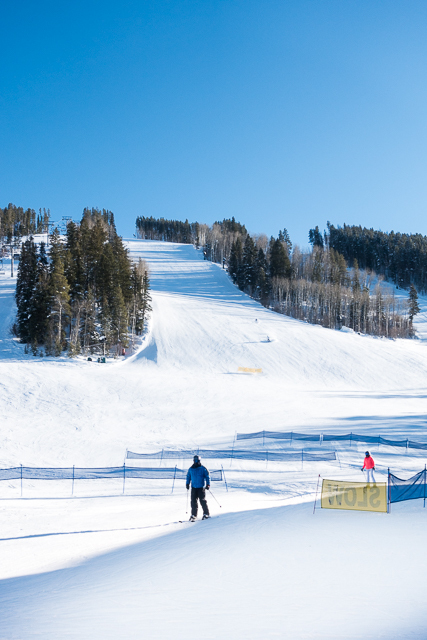 Camp Hale was about a 45 minute ride from our hotel in Beaver Creek. The tour included transportation to and from the hotel. 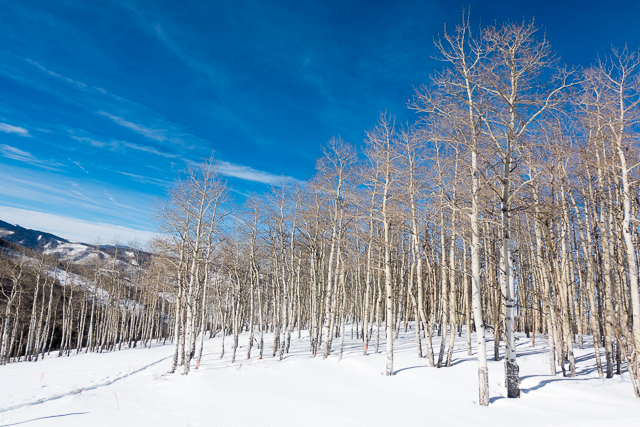 Nova Guides operates under White River National Forest permits on the largest commercial trail system in the Vail area. 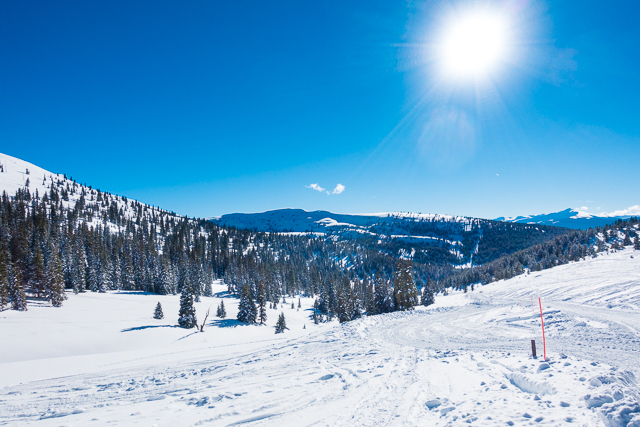 The trails span 55,000 acres, reaching the Continental Divide at elevations of 12,500 feet with views of four surrounding mountain ranges. When you arrive you are given a helmet and snow suit. 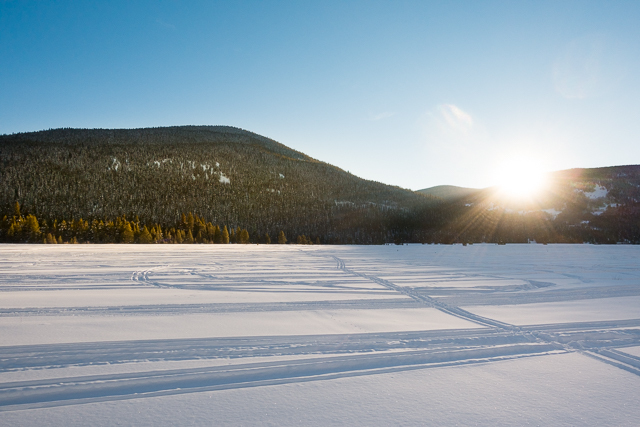 When you pay for the tour, you are offered the opportunity to buy insurance on the snowmobile. We did not buy the insurance. 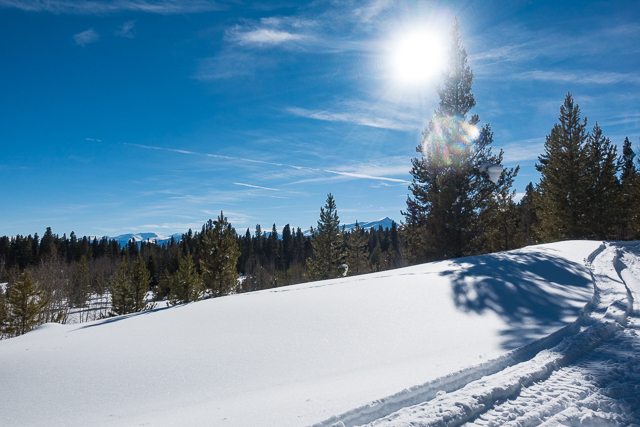 We chose to both drive a snowmobile, but they offer a two seater snowmobile. The views on the trails were incredible! We drove around for about an hour and then started making our way up the mountain to the peak. 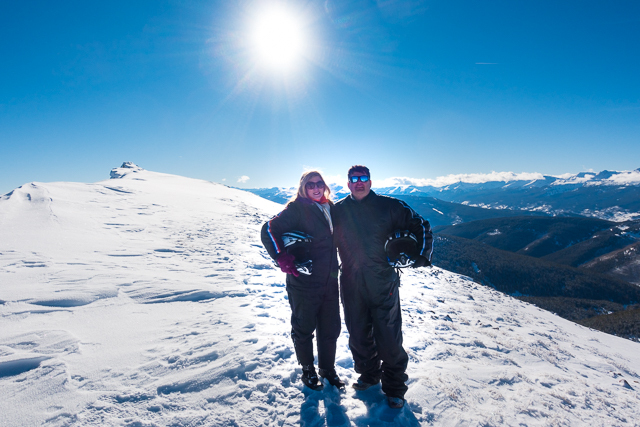 Here we are at the Continental Divide 12,500 feet in the air. We were both huffing and puffing walking up to the top. 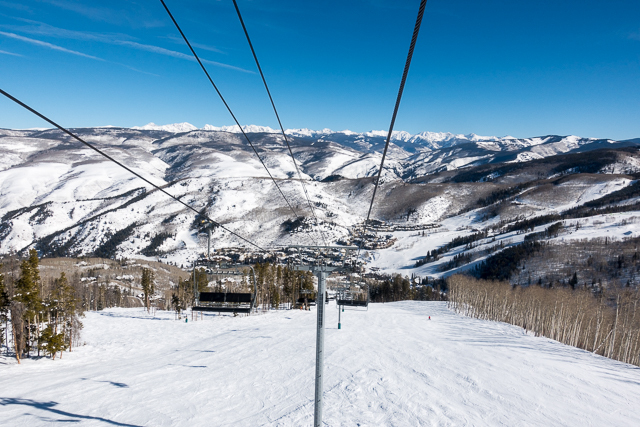 The altitude really makes it hard to breathe. After we made it to the peak, we drove around some more and even did some freewheeling in the open fields. 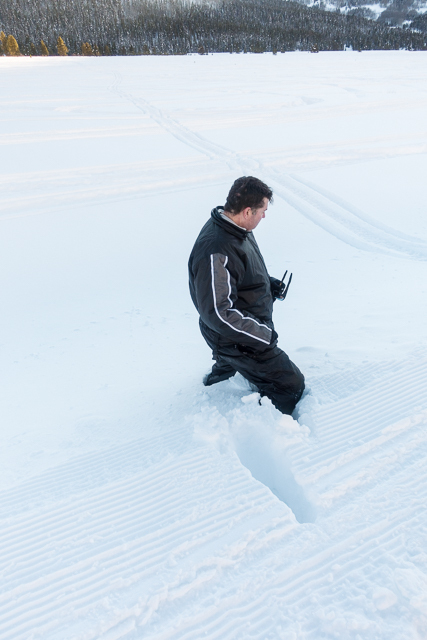 You can see how deep the snow was!! 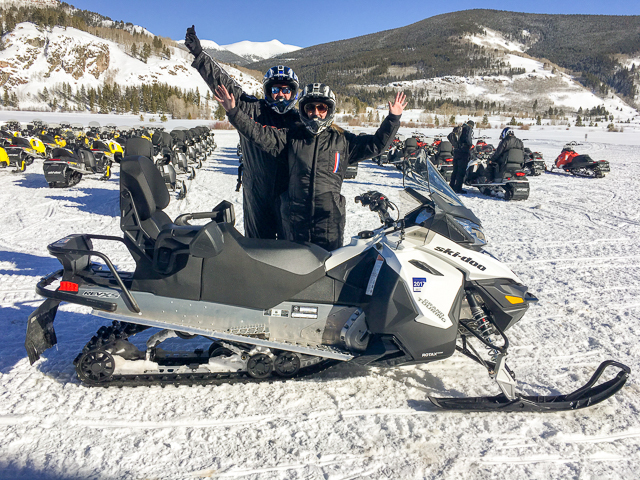 We both absolutely LOVED snowmobiling! We did the half-day tour, but Chicken Legs wants to do the whole day tour next time. I'm not sure I could do a whole day. I was wiped out after the half-day tour! I am not a fan of skiing. 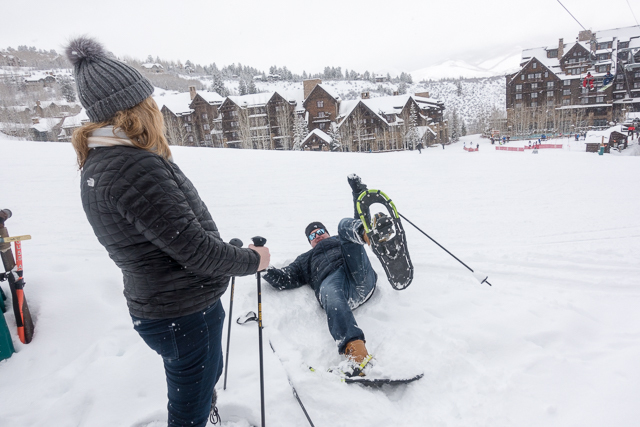 I tried it in Park City and it wasn't for me. Chicken Legs decided he wanted to give it a try since we were here. He did not book his lesson in advance. He just showed up at the ski school the morning of his lesson. There weren't any issues getting into the class. 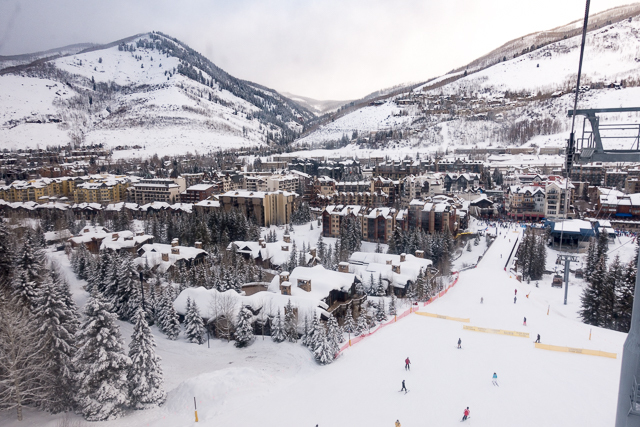 He did a full day of ski school in Beaver Creek. 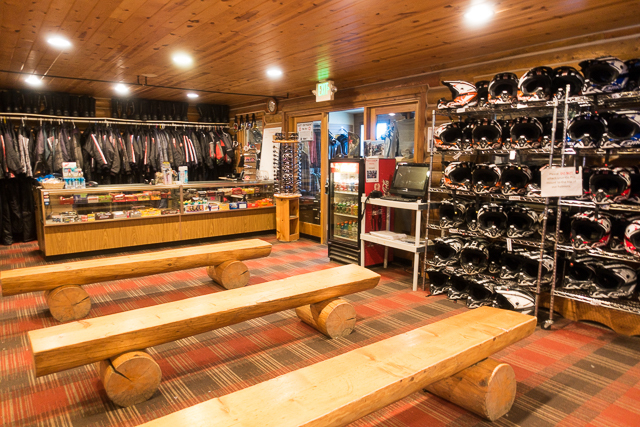 They had a deal that included lessons, lift ticket and equipment rental. Chicken Legs LOVED it! He wants to do half day snowboarding lessons next time. 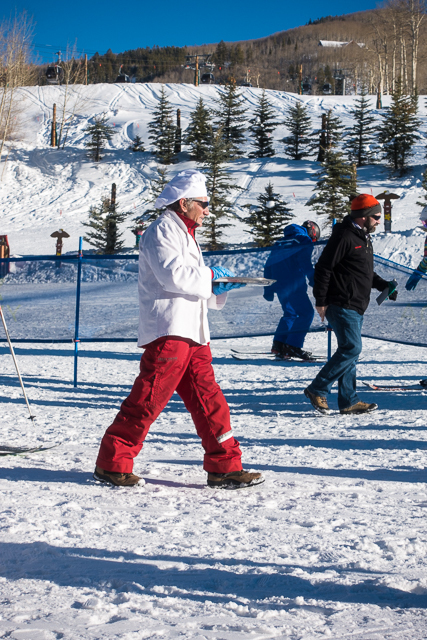 The best part of skiing at Beaver Creek is this man walks around with chocolate chip cookies starting at 3:00. YUM! 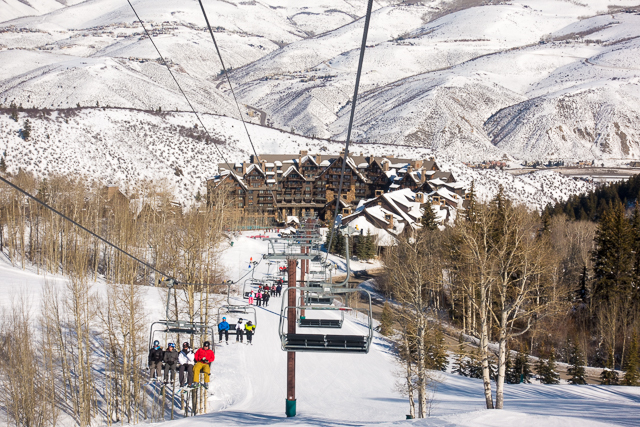 If you aren't a skier, you can still ride the lifts and go to the top of the mountains. 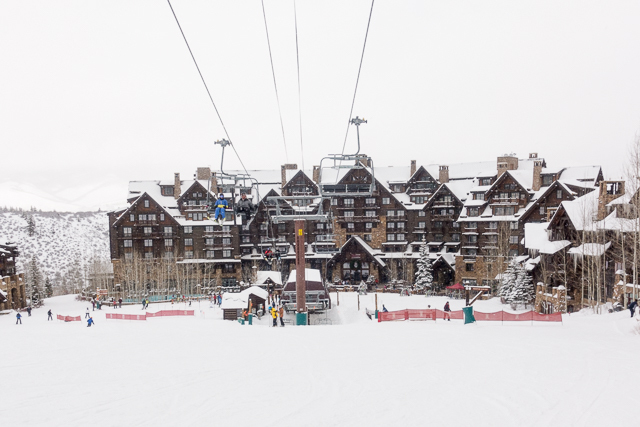 We bought a scenic lift ticket and headed up to the top of mountain at our hotel. 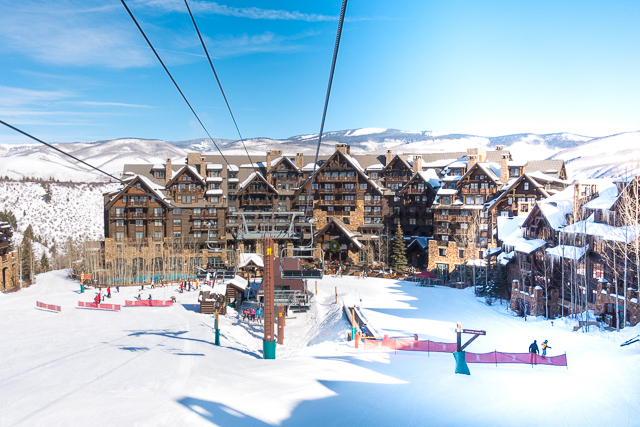 The view of hotel from the lift. 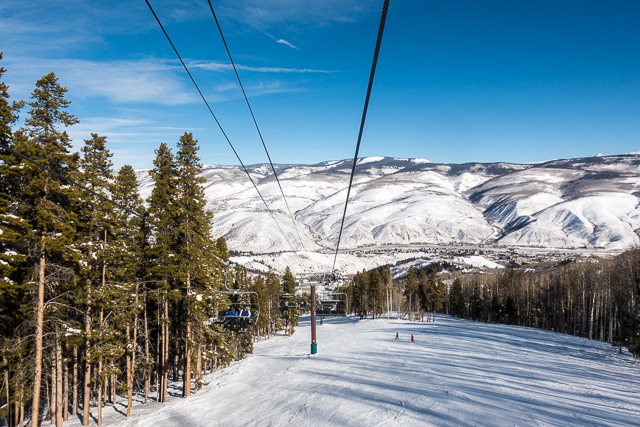 We took the shuttle down to Beaver Creek at hopped on the Strawberry Park Express Lift. 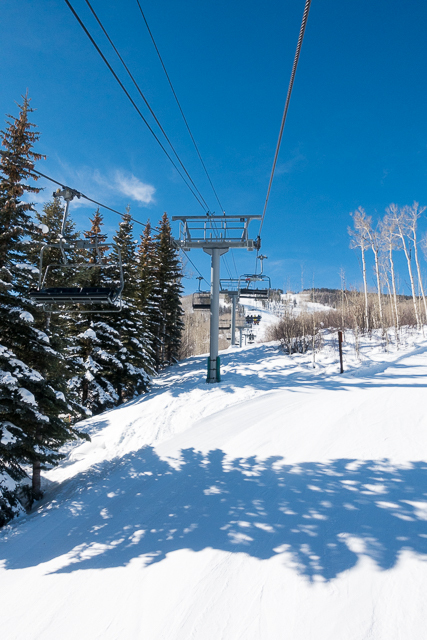 The scenic lift ticket is good for all of the Vail resort lifts and gondolas. 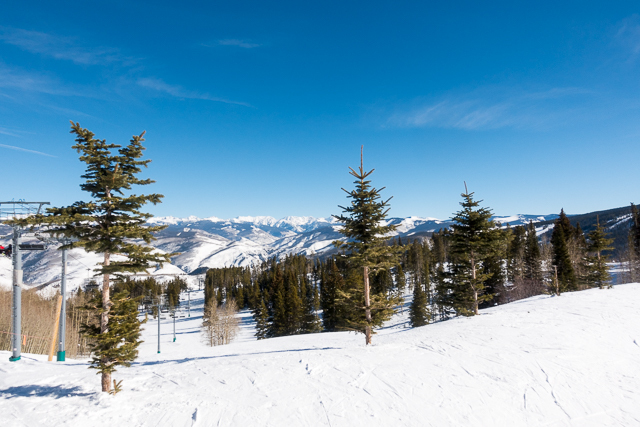 It is a great way to see the views if you aren't a skier. The tickets were $39/each and were valid for the whole day. 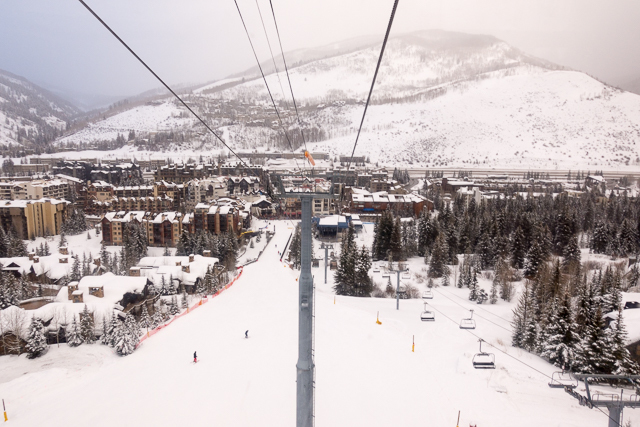 You buy the ticket at the same place you buy regular lift tickets. 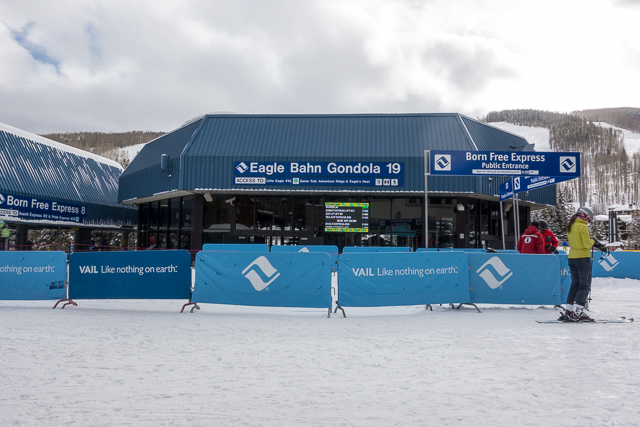 There are booths all over the Vail area to buy the tickets. 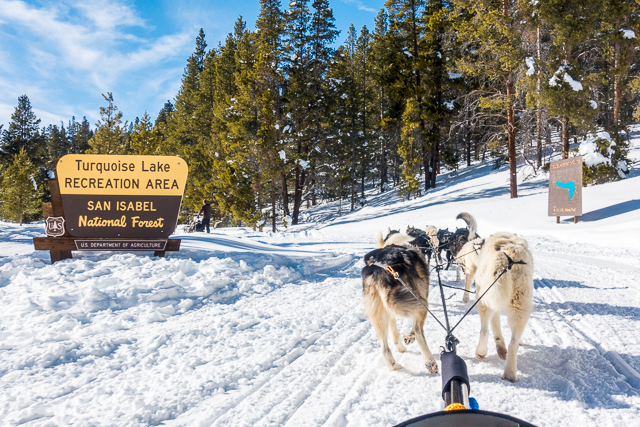 My favorite activity of the whole trip was dog sledding! 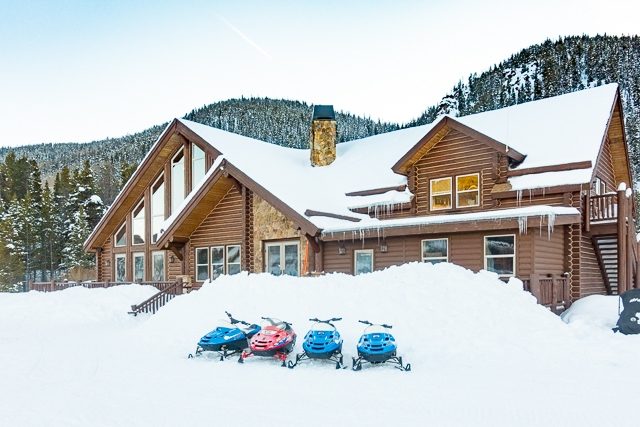 The tour is in the same area as the snowmobiling. It is a little further out. Winterhawk provided transportation to and from the hotel. 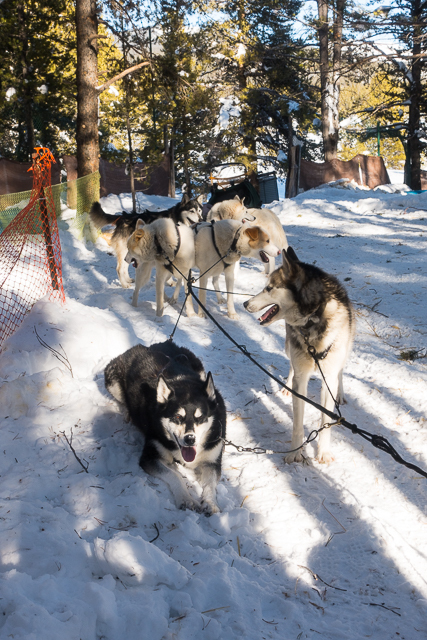 We were picked up by Adam and his husky, Keen Eye. The ride took about 45 minutes to an hour. Adam was very knowledgable about the area and gave us tons of great information about the area. The weather was perfect for our ride. It was sunny and not super cold. We had on a base layer, jeans, sweater, jacket, hat and scarf. 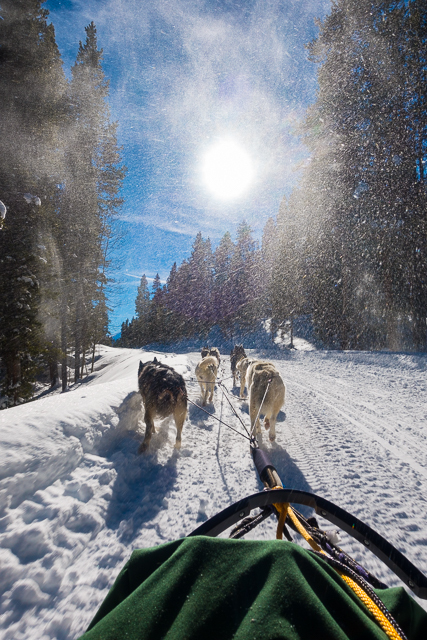 They wrap you in a blanket once you are in the sled. The ride was about 5 miles and took about 45 minutes. We made some stops along the way. You can even guide the dogs if you like! There is a photographer on the trail to take photos. We LOVED this one with all the dogs!! The photos are not included in the cost of the tour. You can buy one for $10, 10 photos for $50 or get all the photos for $100. We just got this one and we LOVE it! You can see from this Instagram video, that the dogs were having a blast on the trail!! The doggies were worn out after their run! 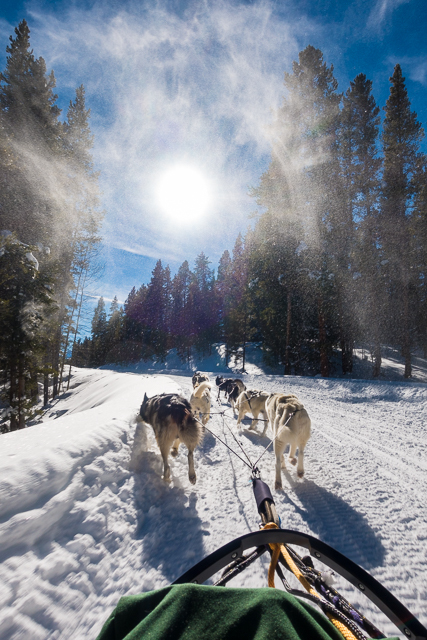 I HIGHLY recommend doing a dogsledding tour with Winterhawk! 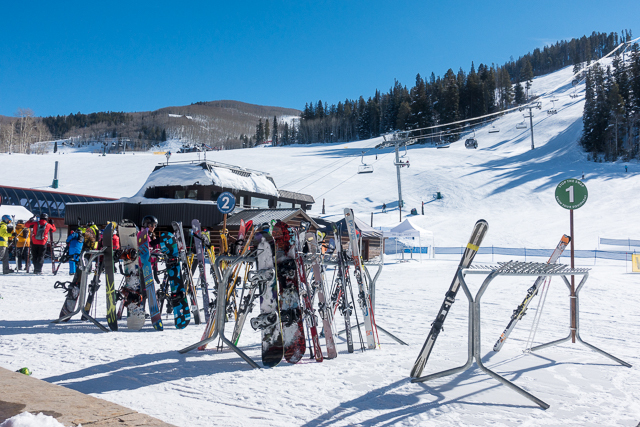 The cost was $200/each for the tour - that included transportation to and from the Beaver Creek area. You have to call to make reservations. 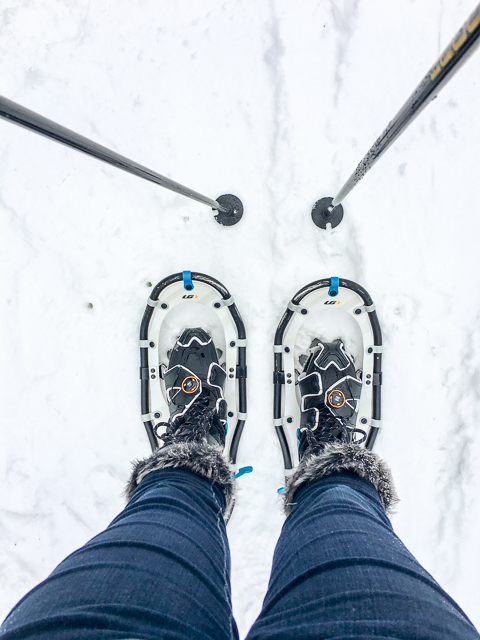 I hate skiing, but I found out that I LOVE snowshoeing!!! We signed up for a snowshoe tour at the hotel. They do daily group tours for $40/person. We met up at the hotel gym. There was only one other couple on our tour, so it was great. 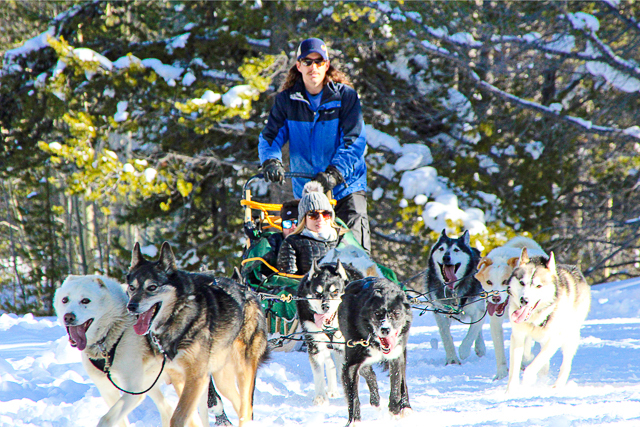 Coincidentally, our snowshoe guide, Jackie, was married to our dogsled guide, Adam! Small world! They were both super nice! The hardest part was adjusting to the altitude. We hiked all around the hotel property. We hiked up to Anderson's Cabin. 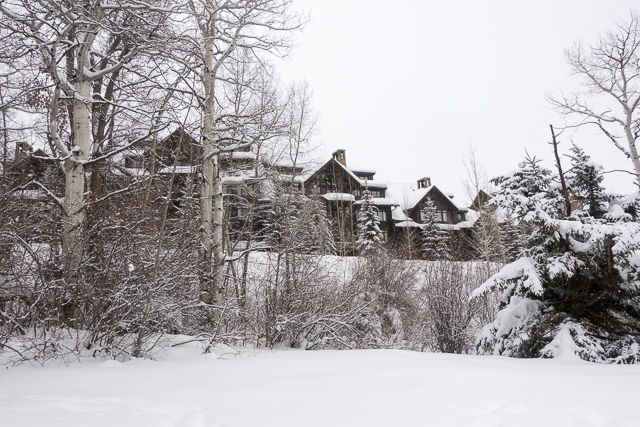 It is the original home of John Anderson, one of seven bachelors who settled the gulch in the early 1900s. 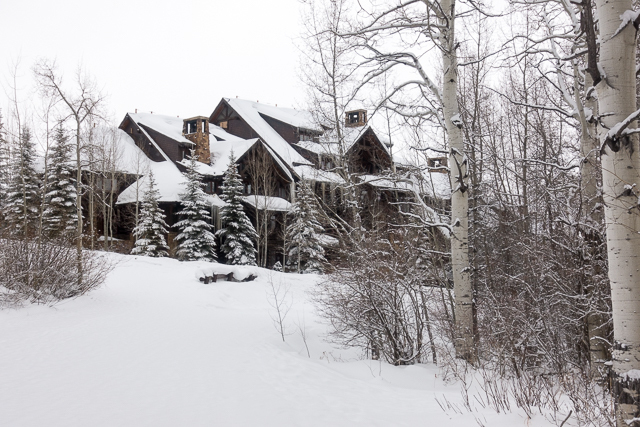 They offer private dinners and parties at the cabin. 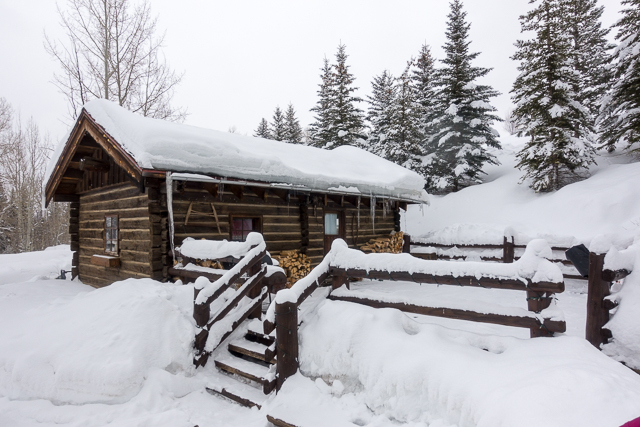 One of the snowshoe adventures includes lunch at the cabin. We might do that next time! It was snowing when we started our tour. Being from the south, we loved it! We had great views of the hotel as we were finishing the tour. Chicken Legs took a tumble! LOL! BIG thanks to Jackie for capturing that moment for us! 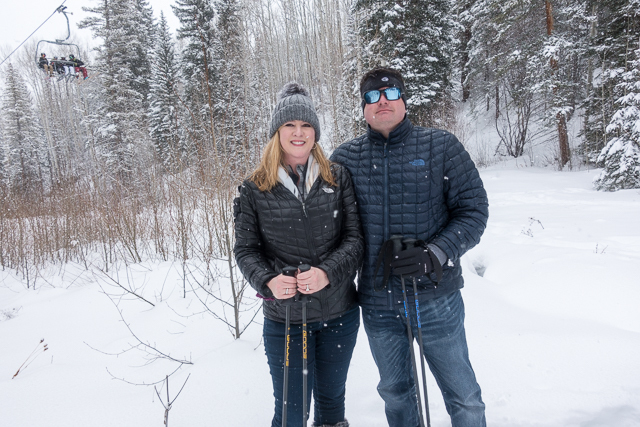 We loved snowshoeing. We would definitely do it again. 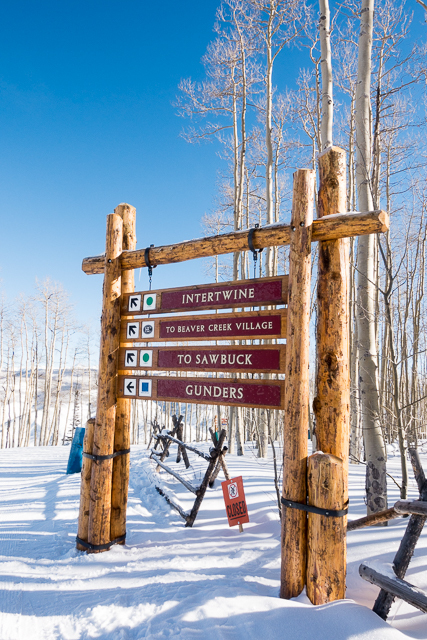 They offer several options all around the Beaver Creek area. I was glad that we gave it a try at the hotel. Jackie was a great teacher! 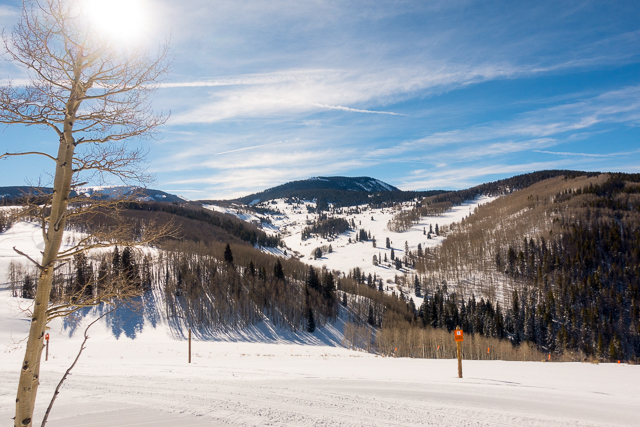 After snowshoeing, we drove into Vail. We were told to check out Lionshead Village for lunch and then ride the gondola to the top of the mountain. 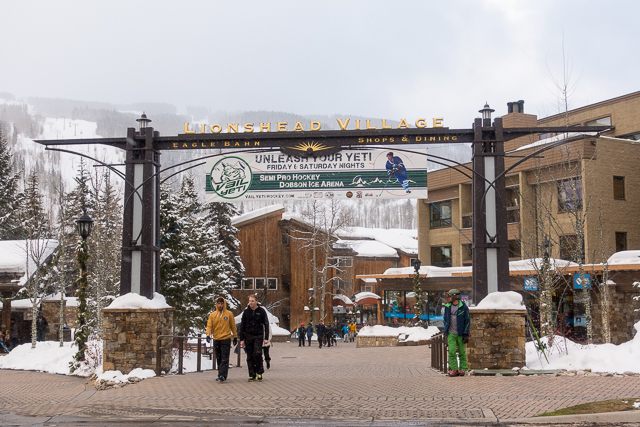 Lionshead Village is the place to be. 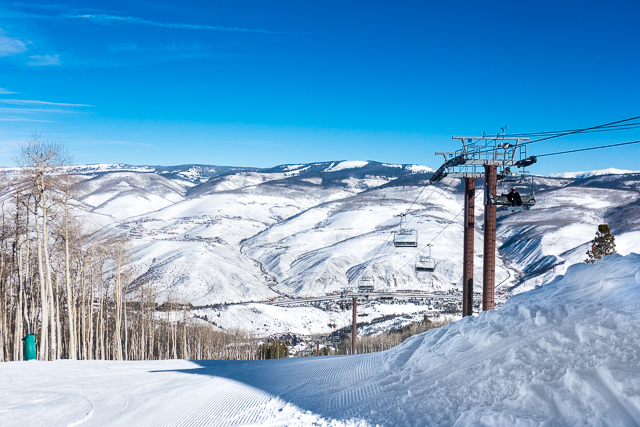 The lift is right there. PLUS there is cheap parking. 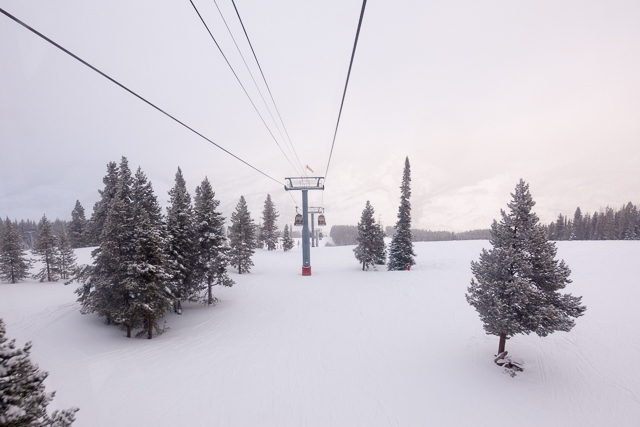 The Gondola is included in the scenic lift ticket. It is also FREE to ride after 3:30. The views weren't the best when we rode up. It was snowing like crazy. 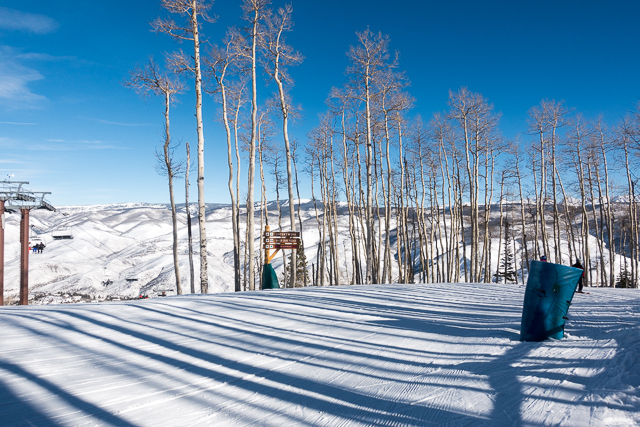 At the top of the mountain is an adventure park where you can go snow tubing. We walked over to watch some people ride. It looked like fun. 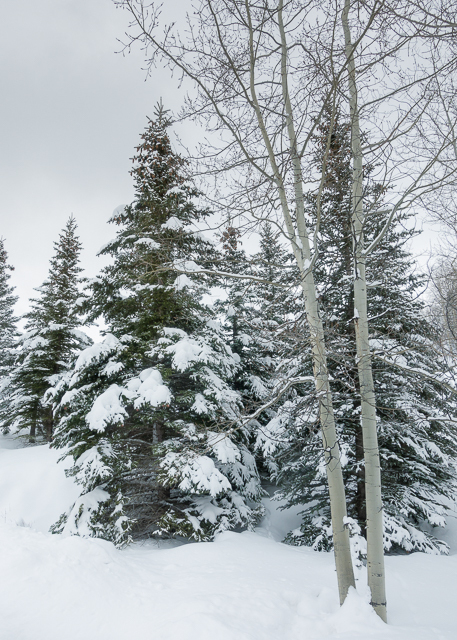 We will definitely try it on our next trip - hopefully when it isn't snowing so hard. 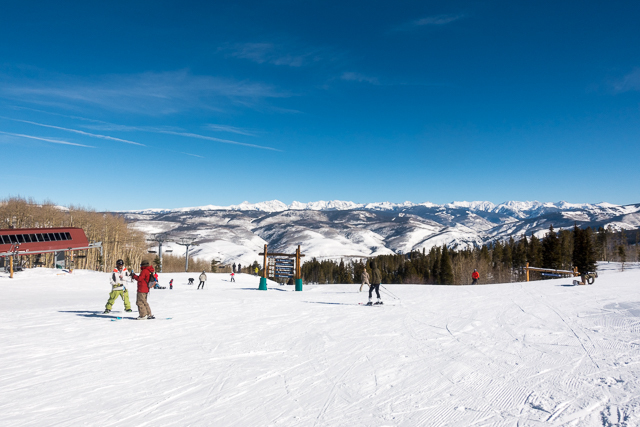 As a non-skier, I had a great time in the Beaver Creek area. 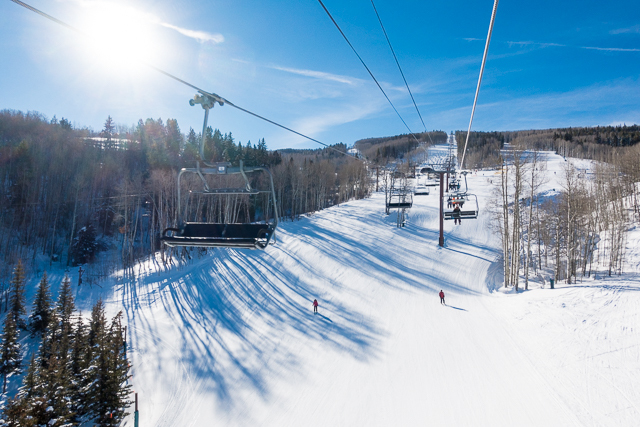 I didn't realize that there was so much to do besides ski! We had an activity every day of our trip. It was great. I highly recommend everything that we did!! 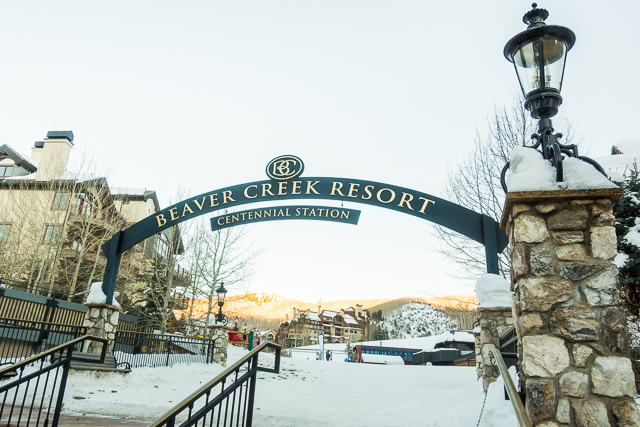 Next week I am sharing everything we ate in Beaver Creek! I love seeing your kitties. Especially on Mondays. When out of town, you really make me miss my kitties. Thank you!